The following list contains excerpts from AROH's Code of Professional Conduct. In my opinion, the Code does not permit its Registrants to publicly comment on health-related matters when relying on non-valid sources e.g. pseudoscientific and/or conspiracy websites, nor does it permit the use of scare articles and/or images to emotionally manipulate patients and the public. Registrants shall provide patients with reliable information and professional opinions, and must not conduct their practice, or the advertising thereof, in a way that might reasonably be expected to mislead or deceive a person, as to the nature and identity of the provider, or as to the nature or quality of the services offered. In relation to clinical practice and the advertising thereof, the welfare of patients, students, research subjects and the public shall take precedence over a practitioner's self-interest and the interests of employees and colleagues, in accordance with normal consulting practice. exploiting patients financially, or misinforming them in relation to health care products or services. When providing advice in a professional capacity, Homoeopaths shall be honest, and explain the advantages and disadvantages, so that the patient can make an informed choice. Registrants shall at all times conduct their practice, communications and affairs in a courteous, dignified and responsible manner consistent with this Code and the AROH Standards of Practice and so as not to bring the Homoeopathic medical profession into disrepute. Registrants must avoid offensive, provocative or misleading statements, publications or conduct. The following list contains excerpts from ATMS's Code of Conduct. Therefore, the Code of Conduct was established as the basis for ethical and professional conduct in order to meet community expectations and justify community trust in the judgement and integrity of ATMS members. 1.1 Members conduct themselves ethically and professionally at all times. 1.3 Members do no harm to clients. 1.10 Members must work within their scope of practice. Members shall not misrepresent or misuse their skill, ability or qualification. Members must not attempt to dissuade a client from seeking or continuing medical treatment. Members should assist a client to find other appropriate healthcare services if required. Members shall not denigrate any person or entity of the healthcare industry. Members shall not engage in any activity, whether written or verbal, that will reflect inaccurately or improperly on natural medicine or ATMS. Advertisements, in printed, electronic media or any other form, must not be false, misleading or deceptive and must be in accordance with applicable legislation. Members shall not make claims of treatment that cannot be substantiated or make claims of a cure. In my opinion, the Code does not permit its Registrants to publicly comment on health-related matters when relying on non-valid sources e.g. pseudoscientific and/or conspiracy websites, nor does it permit the use of scare articles and/or images to emotionally manipulate patients and the public. encouraging people to distrust science-based medicine. NOTE: all evidence was available to be viewed by the public at time of capture. Whatever the short term benefits of our increasingly aggressive vaccination schedules, there may be a price to pay later in our general health and immunity. We find that vaccinations can also be a trigger for allergies, and here we can use specific medicines to counter vaccine side effects. Michael Blanch providing misinformation to convince patients and the public that it is beneficial to contract certain epidemic diseases instead of vaccinating against them, citing notorious anti-vaccination conspiracist, Viera Scheibner, and linking to her article on anti-vaccination conspiracy website, International Medical Council on Vaccination. "Homeopaths understand that the opportunity to contract certain epidemic diseases is beneficial for the developing immune system in childhood, and has health benefits later in life. Dr Viera Scheibner looks at the research evidence. The orthodox approach to both disease prevention and disease management on the other hand is hostile to the body's innate intelligence, Dr Scheiber maintains. 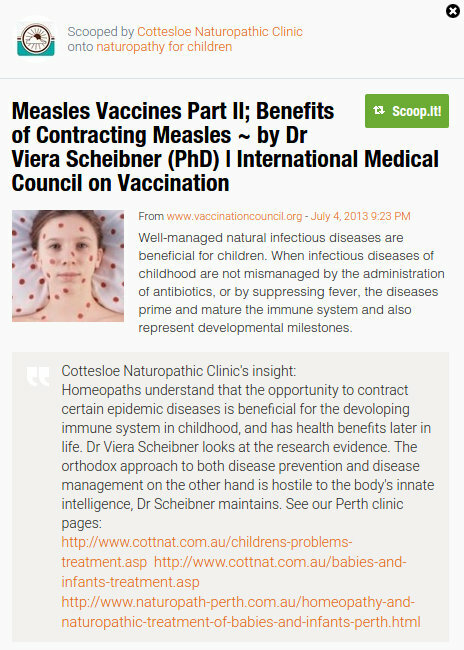 See our Perth clinic pages:"
[title] "Measles Vaccines Part II; Benefits of Contracting Measles by Dr Viera…"
Well-managed natural infectious diseases are beneficial for children. When infectious diseases of childhood are not mismanaged by the administration of antibiotics, or by suppressing fever, the diseases prime and mature the immune system and also represent developmental milestones." Michael Blanch providing misinformation that could encourage people not to vaccinate, posting an article from a health conspiracy website. "One of the world's leading immunologists has set the cat amongst the pigeons by saying: Yes, vaccinations are one of the key players in the recent sharp rise in autoimmune conditions." 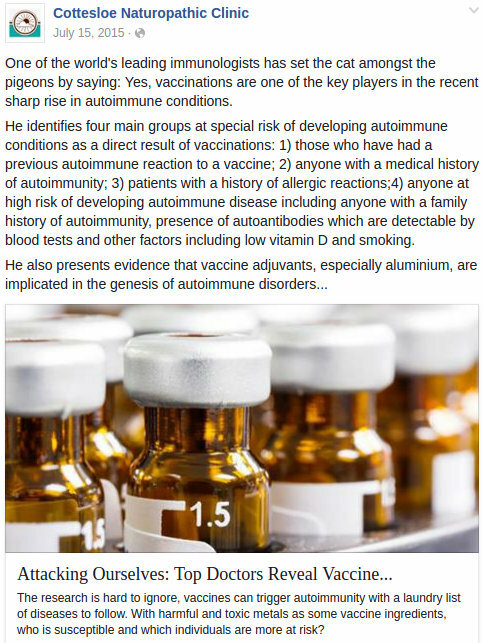 "He identifies four main groups at special risk of developing autoimmune conditions as a direct result of vaccinations: 1) those who have had a previous autoimmune reaction to a vaccine; 2) anyone with a medical history of autoimmunity; 3) patients with a history of allergic reactions; 4) anyone at high risk of developing autoimmune disease including anyone with a family history of autoimmunity, presence of autoantibodies which are detectable by blood tests and other factors including low vitamin D and smoking." "He also presents evidence that vaccine adjuvants, especially aluminium, are implicated in the genesis of autoimmune disorder…"
[title] "Attacking Ourselves: Top Doctors Reveal Vaccine…"
[content] "The research is hard to ignore, vaccines can trigger autoimmunity with a laundry list of diseases to follow. With harmful and toxic metals as some vaccine ingredients, who is susceptible and which individuals are more at risk?" Michael Blanch providing misinformation that could encourage people not to vaccinate. "This article compares the ACCC in Australia to the Ministry of Truth in the George Orwell novel about a future dictatorship - "1984". 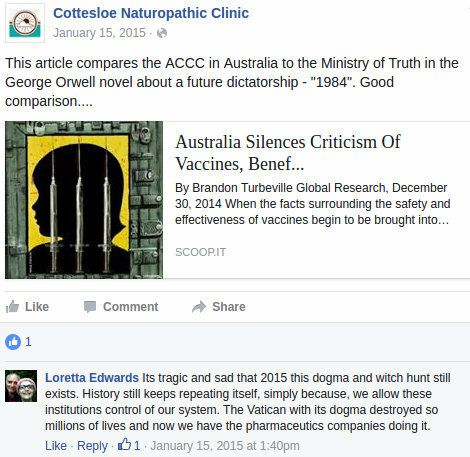 Good Comparison…"
[title] "Australia Silences Criticism Of Vaccines, Benef…"
[content] "By Brandon Turbeville Global Research, December 30, 2014. 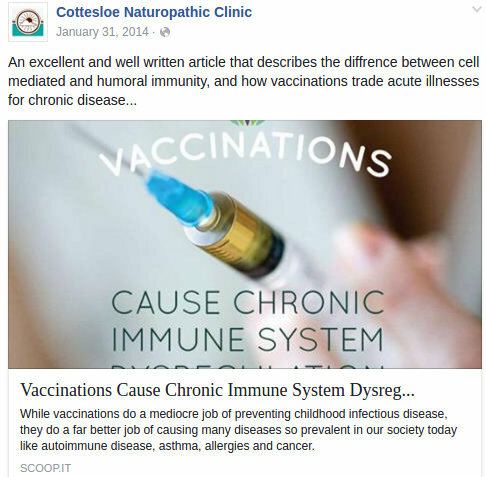 When the facts surrounding the safety and effectiveness of vaccines begin to be brought into…"
"Its tragic and sad that 2015 this dogma and witch hunt still exists. History still keeps repeating itself, simply because, we allow these institutions control or our system. The Vatican with its dogma destroyed so millions of lives and now we have the pharmaceutics companies doing it." 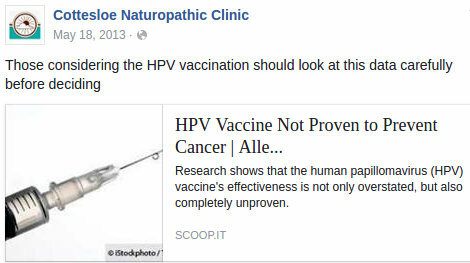 "Those considering the HPV vaccination should look at this data carefully before deciding"
[title] "HPV Vaccine Not Proven to Prevent Cancer | Alle…"
[content] "Research shows that the human papillomavirus (HPV) vaccine's effectiveness is not only overstated, but also completely unproven." Michael Blanch providing misinformation that could encourage people not to vaccinate, perpetuating the debunked vaccine-autism link. "It is consistently emerging that autism is the result of multifactorial causes, not the least of which is the exposure to toxic chemicals during foetal development. 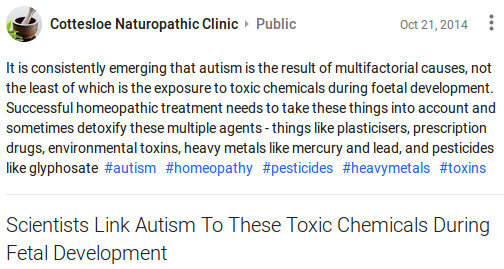 Successful homeopathic treatment needs to take these things into account and sometimes detoxify these multiple agents - things like plasticisers, prescription drugs, environmental toxins, heavy metals like mercury and lead, and pesticides like glyphosate #autism #homeopathy #pesticides #heavymetals #toxins"
[title] "Scientists Link Autism To These Toxic Chemicals During Fetal Development"
"The controversy about links between autism and vaccinations continue. 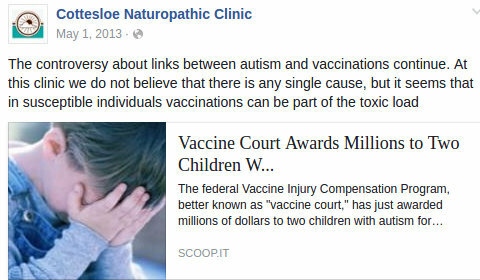 At this clinic we do not believe that there is any single cause, but it seems that in susceptible individuals vaccinations can be part of this toxic load"
[title] "Vaccine Court Awards Millions to Two Children W…"
[content] "The federal Vaccine Injury Compensation Program, better known as "vaccine court," has just awarded millions of dollars to two children with autism for…"
Michael Blanch providing misinformation that could encourage people not to vaccinate, posting an article from a conspiracy news website. 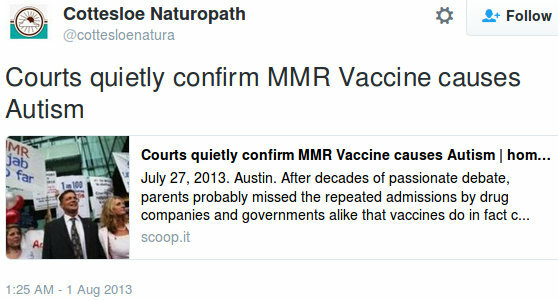 "Courts quietly confirm MMR Vaccine causes Autism"
[title] "Court quietly confirm MMR Vaccine causes Autism | hom…"
[content] "July 27, 2013. Austin. 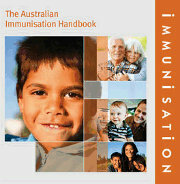 After decades of passionate debate, parents probably missed the repeated admissions by drug companies and governments alike that vaccines do in fact c…"
"Although we are told otherwise, the real scientific evidence shows that paediatric vaccines (and flu shots given to pregnant mothers) still contain substantial levels of mercury…"
[title] "Mercury in influenza vaccines found to be 100 times higher than Australian government limit for…"
[content] "Mercury in influenza vaccines found to be 100 times higher than Australian government limit for medicine"
[title] "New Study Finds A 340 Percent Increased Risk Of Autism In Boy Who Receive MMR Vaccine On Time"
"An excellent and well written article that describes the difference between cell mediated and humoral immunity, and how vaccinations trade acute illnesses for chronic disease…"
[image text] "VACCINATIONS CAUSE CHRONIC IMMUNE SYSTEM DYSREGULATION"
[title] "Vaccinations Cause Chronic Immune System Dysreg…"
[content] "While vaccinations do a mediocre job of preventing childhood infectious disease, they do a far better job of causing many diseases so prevalent in our society today like autoimmune disease, asthma, allergies and cancer." "A holistic medical doctor looks at the controversial topic of the pros and cons of vaccinations and concludes the issue is not black or white, but grey. This is despite the fact that issue provokes extreme and polarising reactions. 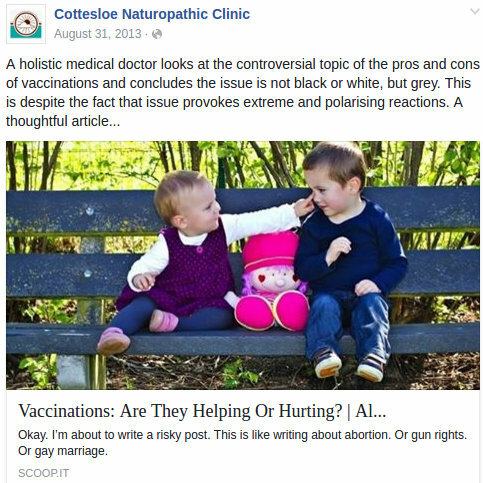 A thoughtful article…"
[title] "Vaccinations: Are They Helping Or Hurting? | Al…"
[content] "Okay. I'm about to write a risky post. This is like writing about abortion. Or gun rights. Or gay marriage." 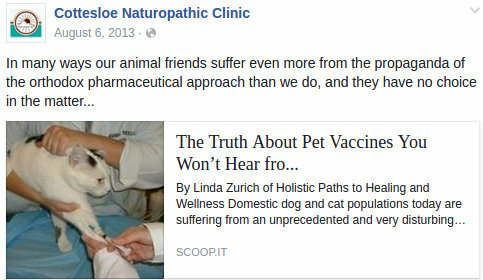 "In many ways our animal friends suffer even more from the propaganda of the orthodox pharmaceutical approach than we do, and they have no choice in the matter…"
[title] "The Truth About Pet Vaccines You Won't Hear fro…"
[content] "Kids Who Are Very Clean and Vaccinated Get Asthma and Allergies More Often"
"It now appears that the shocking mortality of the influenza epidemic of 1918 was not due to the influenza itself but due to weakening of the immune response by indiscriminate use of aspirin, leading to secondary bacterial pneumonia. Homeopaths lost only around 2% of cases, the "old school" 60%. This articles asks the question, are we fearing another pandemic for the wrong reasons? We should be afraid, but perhaps because another "pharmaceutical industry product (vaccines) poses a monumental threat to life rather than a flu which never did." 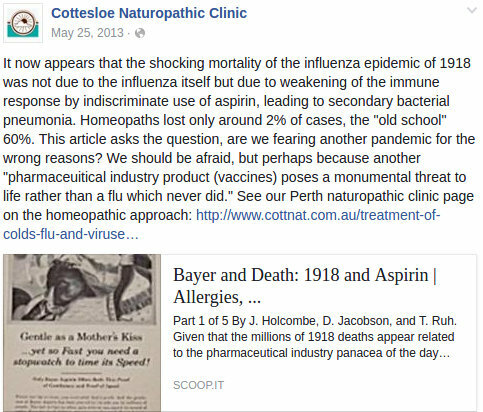 See our Perth naturopathic clinic page on the homeopathic approach:"
[title] "Bayer and Death: 1918 and Aspirin | Allergies, …"
[content] "Part 1 of 5 by J. Holcome, D. Jacobson, and T. Ruh. Given that the millions of 1918 deaths appear related to the pharmaceutical industry panacea of the day…"
"The Amish are against vaccinations, and the vast majority adhere to that philosophy. There have been only three verified cases of autism in their community, and two of these were vaccinated. They are also remarkably free from chronic diseases like cancer, heart disease and diabetes. 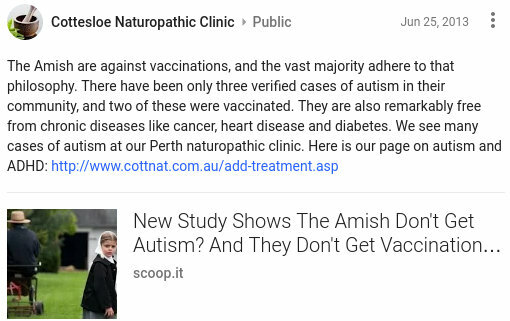 We see many cases of autism at our Perth naturopathic clinic. Here is our page on autism and ADHD:"
[title] "New Study Shows The Amish Don't Get Autism? 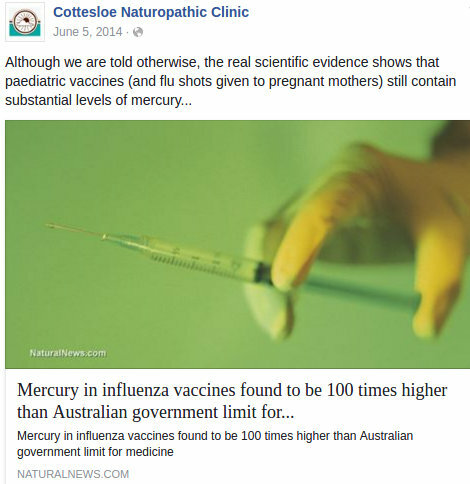 And They Don't Get Vaccination…"
[title] "Why We May Need Viruses More Than Vaccines"
Michael Blanch providing misinformation that could encourage people not to vaccinate, posting an article from an anti-vaccination chiropractic group. 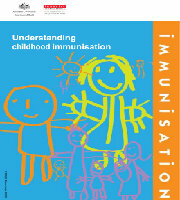 "Surveys show vaccinated children have five times the disease rate of unvaccinated children. This includes both acute and chronic conditions including asthma, reoccurring tonsilitis, chronic bronchitis, sinusitis, allergies, eczema, ear infections, diabetes, sleep disorders, bed wetting, dyslexia, migraines, hyperactivity, ADD, epilepsy, depression, and slower development of speech or motor skills. 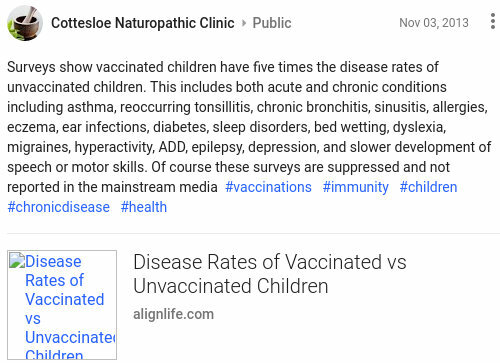 Of course these surveys are suppressed and not reported in the mainstream media #vaccinations #immunity #children #chronicdisease #health"
[title] "Disease Rates of Vaccinated vs Unvaccinated Children"
Michael Blanch providing misinformation that could encourage people not to vaccinate and suggesting that childhood diseases are beneficial to children's development. 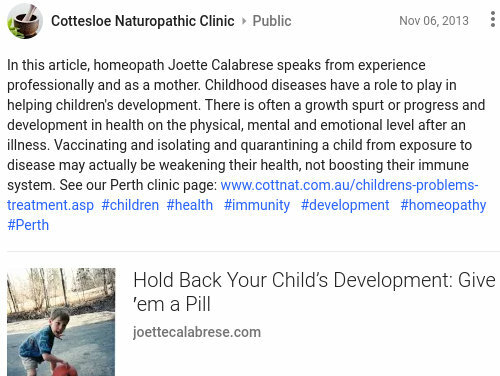 "In this article, homeopath Joette Calabrese speaks from experience professionally and as a mother. Childhood diseases have a role to play in helping children's development. There is often a growth spurt or progress and development in health on the physical, mental and emotional level after an illness. Vaccinating and isolating and quarantining a child from exposure to disease may actually be weakening their health, not boosting their immune system. 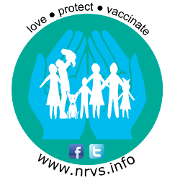 See our Perth Clinic page:"
[title] "Hold Back Your Child's Development: Give 'em a Pill"
[title] "Vaccinated Kids Have 2-5 Times More Diseases Than Unvaccinated"